Popular document sharing and embedding service Scribd Scribd: Online Document Sharing Scribd: Online Document Sharing Read More is getting into the digital book distribution market with the launch of a new subscription service. The company has teamed up with one of the five biggest publishers in the world, HarperCollins Publishers, which will be offering a significant amount of its catalogue to subscribers. Scribd — the new service and the original web app have the same name — costs $8.99 per month and can be accessed on iPhone, iPad, Android and Web browsers. This has been tested for the past 9 months through a beta program, but is now being launched to all users. The HarperCollins catalogue will include its full backlist — books that are over a year old. While the exact number hasn’t been disclosed, the publisher counts some of the world’s most popular authors in its mix, including Paulo Coelho, Neil Gaiman, Marian Keys and Elmore Leonard. Scribd has also partnered with other publishers, including E-Reads, Kensington, Red Wheel/Weiser, Rosetta Books, Sourcebooks, and Workman. Users can draw upon the existing Scribd collection to enhance their reading. “For example, after reading A Tree Grows in Brooklyn by Betty Smith, readers can access papers analyzing the different characters in the book, a doctorate paper on tenement houses in Brooklyn, and even a study guide for the book. 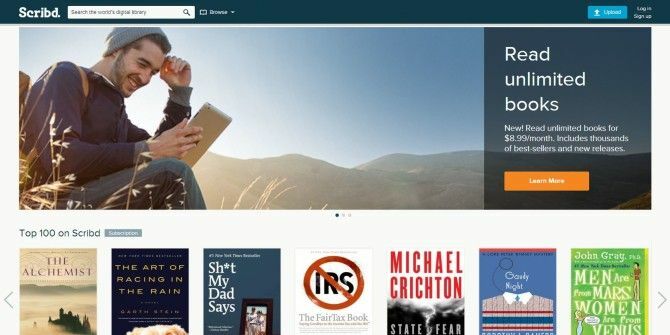 Scribd will also let people easily see what books and documents their friends have read, privacy settings permitting.” the company said. Scribd can be downloaded for iOS and Android or used on the Web. I am sad to say I signed on for this service online for free 30 day trial and found I prefer holding a book. When I called to cancel I was charged $19.99 on 6/13/16 email: loisc93@gmail.com because I was told I cancelled two days past the allotted 30 day trial. When I requested the refund anyway they said they would get back to me in 3-5 business days. But in the meantime I could down load books to my iPad until July 13. Well I expected to hear back from your company as that was June 14, 2016 and I didn't care to read from my iPad. So after calling 877 859-7527 and being put on hold for 17.5 minutes I was told the same response, I would here from the company regarding my $19.99 refund in 3-5 business days! Can you please help me settle this?